At Donatelli’s we have one goal when we cater your event: to wow you and your guests. Whether it’s a simple pizza party, a company gala or your wedding day, we always strive to provide the service that takes the stress out of hosting an event and the food that makes your event memorable. With straightforward pricing and a wide variety of menu options to choose from you’ll discover just how good life can be when our team caters to you. Whether you want us to serve your guests or drop off the food and get out of the way, we make grad parties memorable and easy. From simple to sophisticated, we’ve done ‘em all. Let us “wow” your guests with a menu as unique as your day demands. From box lunches or pizza parties to a full service meal for your annual gala, we’ll create the ideal menu so you can get down to business. From pizza parties and pasta feeds to retirement parties and anniversaries, when you have something to celebrate, we’d love to be with you. Perhaps one of our biggest honors is providing the meal for your loved one's life celebration. You can count on us to make it easy on you. "You and your team have been an absolute pleasure to work with! We couldn't have picked a better place to cater our wedding. Every time we've met I've been treated so fantastic. Unbelievable service. Don't stop doing what you do! I hope you can try the wine soon!" "I ordered the catering for my elopement wedding reception from here... sight unseen and taste untasted completely based on one relative's recommendation and an episode on a food TV show. I'm a little crazy. It was delicious and the fella they sent to help serve the food was a gem. Manicotti with meat and cheese was awesome! Also the Alfredo pasta and the spinach tortellini. (I didn't get any but everyone raved!) .Since then, we've stopped by a couple of times for food and pizza and everything on the menu has been tastetastic." 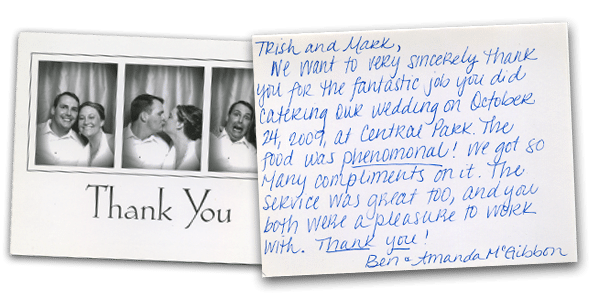 "We want to very sincerely thank you for the fantastic job you did catering to our wedding on October 24, 2009 at Central Park. The food was phenomenal! We got so many compliments on it. The service was great too, and you both were a pleasure to work with. Thank you!" "We have been "regulars" at Don's for over thirty years. The food is always outstanding and I love that you can buy sauces and soups to take home along with many other items. Don's catered our daughter's wedding 10 years ago and I've never thought of wedding food as being delicious. We had many guests tell us how delicious the food was. I have eaten just about everything on the menu from spaghetti to pizza to burgers and all of it has been outstanding. The staff is fantastic and we feel like they are family after all these years. Don't miss out on delicious food!" 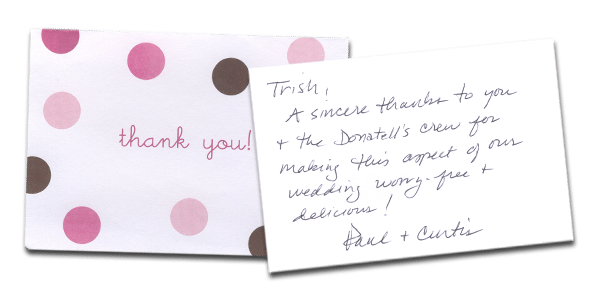 "A sincere thanks to you & the Donatelli's crew for making this aspect of our wedding worry-free & delicious!" "I've done it all in terms of Donatelli's. Several times I have dined at, booked the party room, gotten take-out or had catering from Donatelli's, and the food has never disappointed. Over the past decade living nearby, I can tell you that the food is consistently great. From the pizza and pasta to the burgers, soups and salads, I've never had a bad meal."